Sometimes, it takes a bundle to make a bundle. Like most large software companies, VMware has two different customer sets: large companies that have enterprise licensing agreements with all kinds of deals, and SMBs who buy software occasionally and who don't usually get much of a deal. In its conference call with Wall Street analysts going over its fourth quarter financial results and announcing that it would be laying off a little under 7 per cent of its workforce, Gelsinger & Co also said that they would be doing a few things to boost the so-called "transactional" business. This means customers who are not on ELAs and, as it turns out, bundling and discounting products. The first of those promised products come to the vSphere server virtualization stack today. VMware is doing a bunch of different things to help make its products more appealing and affordable for SMBs, Michael Adams, group product marketing manager for cloud infrastructure, tells El Reg. First, VMware is taking the Standard Edition of its vCenter Operations Management control freak and moving it into a vSphere bundle. vCenter Operations Management has changed a lot of the past two-and-a-half years, but it is a mashup of various tools that came from the Ionix products that VMware bought from parent EMC in February 2010, the CapacityIQ tool created by VMware back in July 2010, and other features. vCenter Operations Management Suite comes in four editions, ranging from the Foundation Edition with basic performance and health monitoring for hypervisors and virtual machines through a dashboard to Enterprise Edition that does capacity planning and cost analysis, among many other things. "As vSphere customers grow, they start to need tool to monitor capacity and health," says Adams. And, VMware also wants to get them on the path of using progressively more costly and presumably more useful tools to help automate their virty infrastructure. The Standard Edition of vCenter Operations Management includes the basic vCenter Operations Manager module plus the basic performance and capacity optimizations, which allows system administrators to set dynamic thresholds for CPU, memory, and I/O capacity for virtual machines, rightsize VMs based on historical capacity and performance, and get proactive alerts when VMs are starting to behave piggishly. 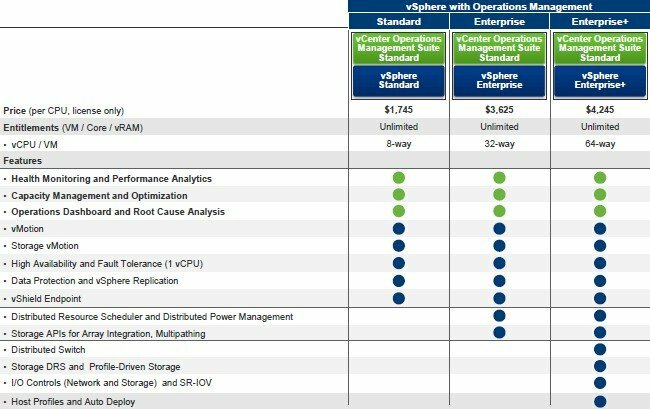 Adams says that customers with either the Enterprise or Enterprise+ editions of the vSphere stack, ranging from the 4.0 through 5.1 versions, will be offered an upgrade to the vSphere with Operations Management bundle. The bundle has around a 15 per cent discount baked in for a representative number of VMs if you bought vSphere and vCenter Operations Management Standard Edition separately. The second update to vSphere is a revved up version of the backup and recovery software for virtual machines. The initial vSphere Data Protection feature that launched with vSphere 5.1 last August is based on EMC's Avamar software. This Standard Edition of VDP could back up as many as 100 virtual machines per backup appliance instance and up to 2TB of capacity across those VMs. Adams says the new VDP Advanced Edition can scale up to 8TB of capacity across as many as 400 virtual machines per appliance instance. VDP Advanced Edition, which is an add-on for vSphere tools and which is not free but rather costs $1,095 per socket with an unlimited number of VMs protected, also has a much-improved de-duplication algorithm and has built-in integrations with Microsoft's Exchange Server mail server and SQL Server database server. So why doesn't VMware just go all the way and create a vSphere stack and vCenter console bundle? Well, it has, in a way, without hard-bundling it for transactional customers. 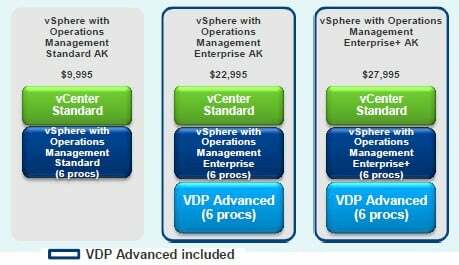 VMware sells something it calls "acceleration kits," which put together vSphere, vCenter, and now VDP Advanced Edition into a softer bundle that gives customers another 15 per cent or so off the list price cost of buying these elements together. These acceleration kits are, for all intents and purposes, the basic enterprise-grade vSphere kits that customers can expect to need, and with the discounting built in, that is about the best deal that they could negotiate on their own. The thing to remember is that the acceleration kit licenses are for up to six processor sockets, with prices ranging from $9,995 to $27,995 across those six sockets, depending on the feature set. That seems like a big number compared to the price of three decently configured two-socket servers, which might cost $15,000 to $20,000.